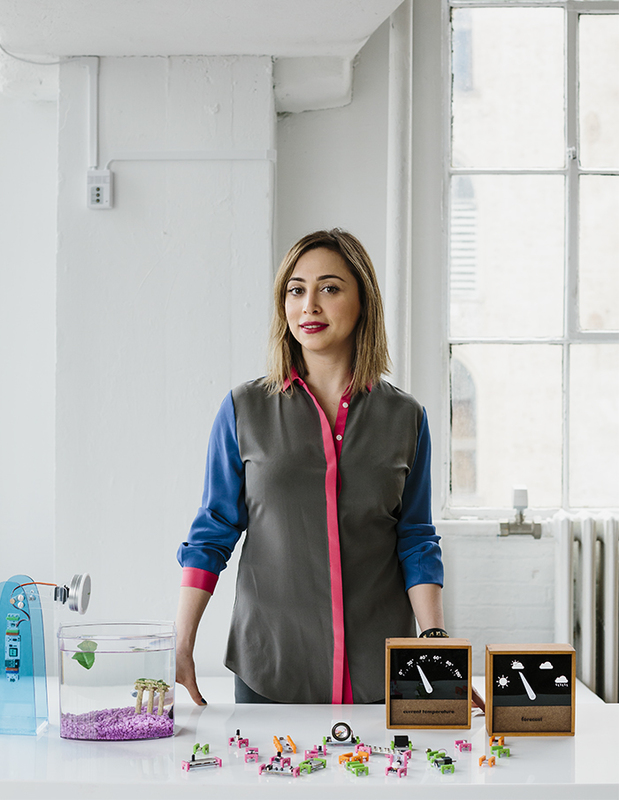 Through her company littleBits, MIT-trained engineer Ayah Bdeir turns humble objects into remote-controlled, Internet-connected tweeting machines. Ayah Bdeir founded littleBits in 2011. The company produces a library of electronic modules that can be used to create all manner of devices, like a remote-controlled fish feeder and weather monitor. A preassembled kit of parts allows users to build a music synthesizer. Traditional electronics require soldering whereas littleBits’s modules snap together with magnets to create things like a doorbell that sends text notification. A littleBits employee prototypes a new project. New York firm MCDC designed littleBits’s Chelsea office, which is outfitted with Togo sofas from Ligne Roset and an overhead fixture by Tech Lighting. The shelves hold books and play materials like Legos and K’nex. The windows of the company's office are covered with sketches. The company collaborated with Labour, a Brooklyn-based design studio, on “Art Handles,” a 2013 installation for MoMA Design Store. We’re living in the age of weather-forecasting refrigerators and thermostats you control from your car. And, according to littleBits founder and CEO Ayah Bdeir, you shouldn’t have to buy them—you should be able to turn your Reagan-era Mr. Coffee into an auto-brewing smart gadget yourself. Bdeir is an engineer, MIT Media Lab alum, and TED senior fellow who wanted to inject more creativity and fun into her work, making math and science exciting to everyone. Her brainchild, littleBits, bills itself as “DIY electronics for prototyping and learning.” They’re magnetic, candy-colored modules that snap together to build circuits—no wiring, programming, or soldering required. Bdeir’s main motivation was to equip people with the skills and interests needed to thrive in today’s tech-filled world. She regards technology as a language, and believes that nowadays, those who don’t speak it can be paralyzed. It isn’t okay to have someone constantly fix everything for you or buy everything for you, she says. You can master technology yourself—and with littleBits’s new Smart Home Kit, you don’t need to buy pricey home gadgets that’ll become obsolete in six months. The Smart Home Kit is the company’s first foray into “the Internet of Things,” the trend of designing objects with software and features that connect them to the Internet. Prior to that, littleBits focused on packages and projects for educators, makers, programmers, and kids, including a preassembled kit of parts to build a music synthesizer or a “Mars Rover.” (The Museum of Modern Art, in New York, included littleBits in its 2011 exhibition Talk to Me, citing the company’s efforts to engage non-experts with technology.) The Smart Home Kit comes with 14 modules, 11 accessories, and 14 project guides with thousands of other user-generated ideas on the company’s website. Use the included MP3 player module, servo, and synth speaker to build a system that will automatically open your curtains and play a wake-up tune every morning at a set time, for instance. Or assemble a contraption that automatically dispenses treats for pets. The idea is to take products that exist in users’ homes and revamp them to embrace technology. For example, the Smart Home Kit’s “Coffee Control” project: a scheme that makes an ordinary brewer automatically prepare coffee with just the touch of a button. It can take almost an hour to set up, but sure enough, you’ll soon be churning out a cup of French vanilla from across the kitchen. There’s a very small learning curve to get acquainted with the various parts and modules, and initially connecting the kit to the Internet takes some time. After figuring out the lay of the land, though, everything’s pretty intuitive. However, it begs the question: Is it really worth going through all the trouble to outfit a dryer to send a text message when laundry’s done? Why not just drive to the nearest electronics superstore and purchase ready-made gizmos? For design-minded folks, Bdeir says it pays off.